A clean oven is a healthy oven. Cooking food every day in a dirty oven, scaled with stale grease and oil residue is anything but healthy. And not to mention that it alters the taste and flavour of your meals. A clean oven will cost you less to run, because if it’s dirty, it will take longer to heat up. A clean oven is also a safe one, because you don’t risk a fire hazard if left unattended for too long. Your oven deserves to be cleaned on a regular basis. However, this domestic chore is one of the most undesired and avoided by many people, as it takes a lot of time and scrubbing. 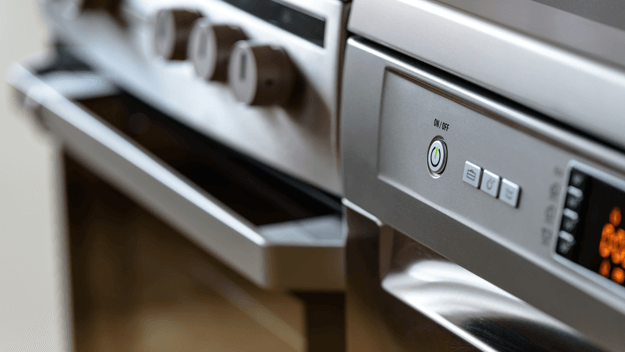 Instead of spending hours on cleaning and polishing all hard-to-reach surfaces inside your oven, use our specialised oven cleaning as the better alternative. The end result is a clean, fresh and shining oven, ready for you to cook the next meal in it. This quality oven cleaning service is available as a standalone or in combination with any other domestic cleaning service. All utilised oven cleaning methods are perfectly safe and suitable for any type of cooking appliance. No abrasive products and materials are used when cleaning, which means no risk of damage to the delicate components of your appliances – protective coatings, knobs and dials, door gasket, heat resistant glass, etc. The process of this thorough oven cleaning starts with initial inspection of your cooking appliance. Then our technician will take out all removable parts and place them in a vat of special cleaning solution. This dip tank technique is powerful enough to clean all build-up grease and food deposits, and at the same time gentle enough to all metal parts, preventing abrasive damage. The door is also removed and split apart to clean between the glasses. Any carbon behind the fan is removed, as this is the common cause of smoking from the oven at high temperatures. At the end, your oven is re-assembled and polished. It should be ready to use shortly after cleaning, because all used solutions dissolve and evaporate almost immediately without any trace of residue.